Raudfeldsgja Gorge is well cemented in old tales of ancient Iceland. 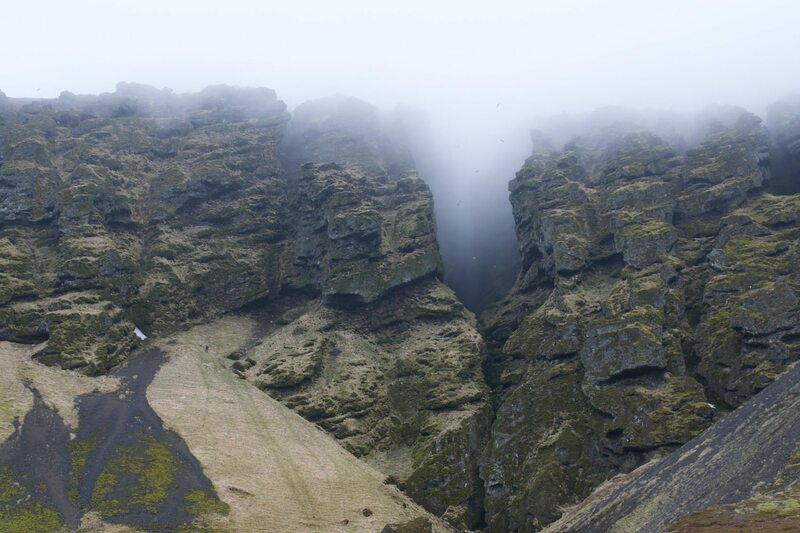 It is said that in the back of this fissure, one can feel the spirits of the two brothers Rauðfeldur and Sölvi. The story takes place over 1,200 years ago, and has been documented and passed down throughout the years in the Sagas of Icelanders. In this tale, the two brothers were with their father, Þorkell. This man was the half-brother of the infamous half-troll, half-man Bárður Snæfellsás (the namesake of the Snaefellsnes Peninsula). Þorkell and Bárður had spent their childhoods together in Arnarstapi. The two brothers, Rauðfeldur and Sölvi, often had adventures with some of Bárður’s daughters, of which he had fathered many. One morning, the two lured one of the daughters, Helga, out onto a dangerous iceberg. As part of their game, they playfully pushed the iceberg into the ocean. Sadly, the presence of very high winds took the iceberg and quickly blew it offshore and deep into the cold, open Atlantic. This news of her fate at the hands of the brothers Rauðfeldur and Sölvi took a long time to reach Bárður Snæfellsás, due to lack of communication ability in the timeframe. As the story goes, however, Helga did not perish on that iceberg. Rather, she floated in the open ocean for seven days and eventually reached Greenland. From there, she is said to have lived a beautiful life with the family of Erik the Red for many years. In a poem that has been preserved in the Sagas of Icelanders, Helga wrote of how much she missed her family, father, and the wonders of Iceland. Eventually, Bárður Snæfellsás learned of the transgressions of the brothers against his daughter. 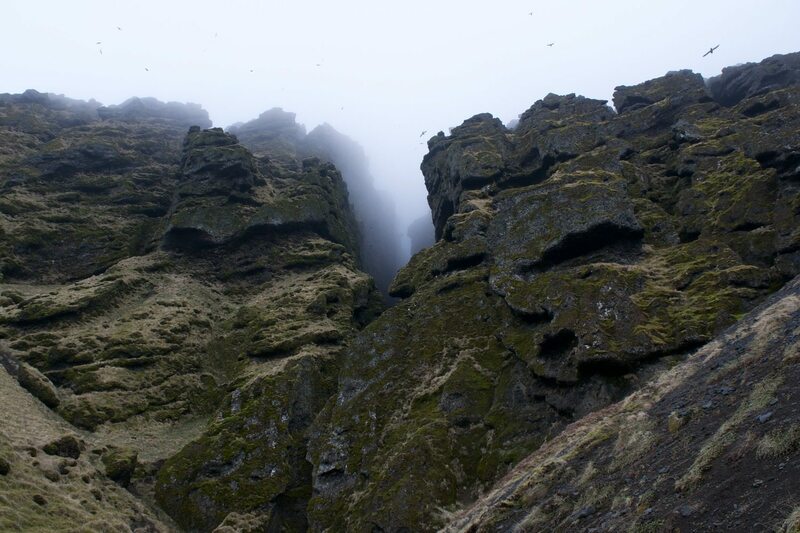 In a fit of rage, he took the two brothers (who were age 12 and 11 at the time) and pushed Rauðfeldr into the Rauðfeldsgjá ravine and threw Sölvi off Sölvahamar, a high cliff on the coast east of Arnarstapi. Both boys were said to have perished upon impact. Bárður proceeded to walk to a nearby glacier (Snæfellsjökull) and constructed an ice cave, where he is said to live to this very day. The Rauðfeldsgjá Gorge was a quick ten minute drive from the Snaefellsnes visitor center. The fog that had been present all afternoon was still very much present when we arrived. This was one of the few places I had not researched before our trip, and I was completely unsure what to expect. All I knew was that we were looking at a pretty solid cliff face. A small river in a ravine was to the left. For a while as we walked I honestly thought the ravine was the gorge. When we got closer, we were awestruck at what the actual gorge was. Do you see that crack in the above image that opens upwards into the fog? That’s the gorge. Do you see that small dot on the hill to the left, directly to the right of the small white patch of leftover snow? That’s a person, the only person there in our time at the Rauðfeldsgjá Gorge. Hundreds and hundreds of birds circled overhead, as can be seen in the video at the end of this post. As we continued our approach, the true gravity of what we were looking at began to take shape. This gorge was maybe five feet wide at the base, and opened up into a massive fissure-like gorge. It was a cave with an open top. The rushing river took up the width of the opening, so we had to hope from rock to rock to get inside the gorge itself. 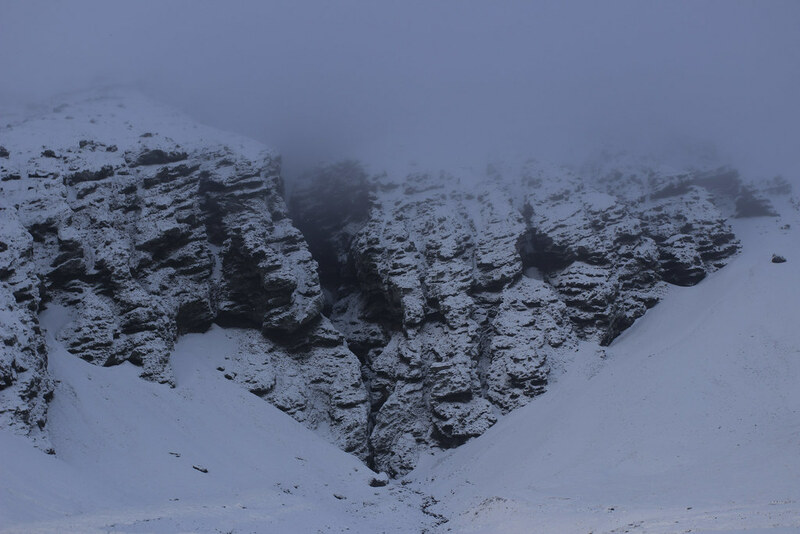 Here is a skewed vertical panorama of what the Rauðfeldsgjá Gorge looks like from the inside, after stepping across some stones to get inside. The cacophony of one thousand birds echoed down. Everything was damp and mossy. To the right was a nice area to stand and take it all in. To the left the river continued. If the water level was lower and it had not been raining heavily the entire week, we would have continued, as there is a small waterfall with a climbing rope further upstream. Here is the view when looking outwards from the entrance of the gorge. It was absolutely beautiful, even with the heavy fog. By this point the man on the hill had been long gone, and we had the place to ourselves. If you look in the distance, you can see the Atlantic Ocean and waves crashing. This natural wonder, which we had low hopes for upon our arrival, was definitely one of the top five things we experienced on our trip to Iceland, if not one of the two best (along with Dyrholaey). 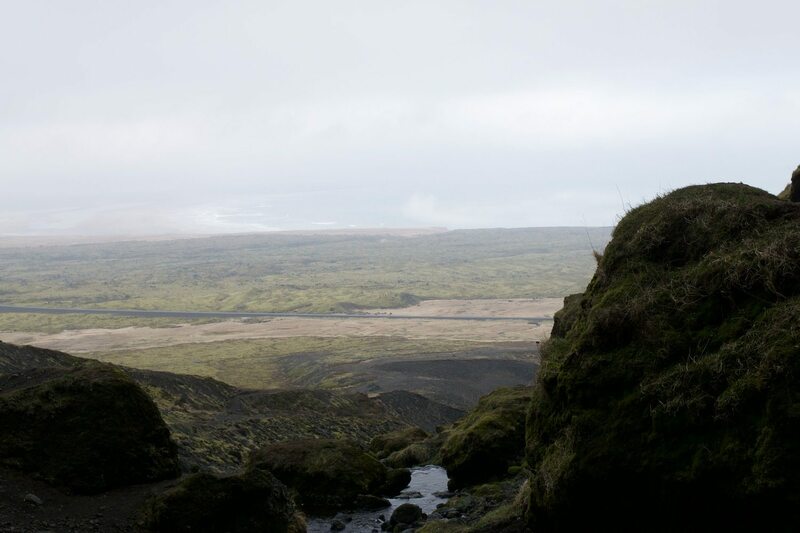 The remoteness of the Snaefellsnes Peninsula, combined with the ease at which people will pass this attraction by and lack of available information online, make the Raudfelsgja Gorge an ideal attraction and natural wonder for those looking for peace and serenity. Additionally, the short hike required and slippery rocks necessary to traverse make the gorge insides a rare sight to behold. There is a nice, flat parking area right off the Utnesvegur/Road 54 with signage explaining what the attraction is. The lot is gravel, so there is no need to deal with wet grassy roadside parking. In the winter, the entire area can become frozen over and covered in a thick layer of snow, making visitation to the inside of the cavern impossible. After heavy rains, the entrance to the gorge can become dangerous to traverse, with fast-running water pouring out of the entrance and leaving zero room for dry navigation. If this is the case, prepare to get wet! If you are frightened by birds, it is highly recommended to steer clear of this natural wonder. If you show up earlier in the morning, the odds of being the only people present are far higher. As we were leaving, another vehicle pulled up. It is highly recommended, to enjoy this beautiful sight to the best of your safety and ability, to travel in the warmer months, after a lot of the snow has melted. The Raudfelsgja Gorge looks far different in the winter. The rocks and water might be frozen, making entry into the gorge itself harrowing and dangerous. We went to this gorge in May, which is likely the ideal time to travel to this peninsula. Much earlier, and you may experience winter issues like the above linked image. Much later, and you might find yourself waiting in line behind brightly colored tourists for your chance to peek in the crowded atrium.